Participation in the Holy Mass in St. Peter’s Basilica, in the Great Parade and the Regina Coeli – Angelus prayer at St. Peter’s Square with Pope Francis. The Associazione Internazionale Amici della Musica Sacra (International Association Friends of Sacred Music) promotes for the eleventh time in Rome the parade organized by Courtial International. An extraordinary event whose protagonists are folklore, music and fun. The event has been conceived for costume groups and music bands (marching bands, big bands, brass bands, youth bands) who want to bring their music to the Eternal City and to experience a cultural exchange with bands of other countries. Take part in this unique event! The Roman audience and tourists from all over the world will be an extraordinary setting. • 12.00 PM - Meeting of the organizers with the band directors. • 2.00 PM - Gathering of all bands on Piazza del Sant'Uffizio. • 3.00 PM - Holy Mass in St. Peter's Basilica. The bands will take part in the celebration playing some music. • 5.00 PM - Start of the parade through the streets of the center of Rome. • Lining up of the bands in circle on Piazza Pio XII (St. Peter's Square). Performance of Beethoven's Hymn to Joy (European Hymn). • At the end, Pasta-Party with all participants. • Noon: Possibility for all bands to participate in Angelus Prayer with the Holy Father. 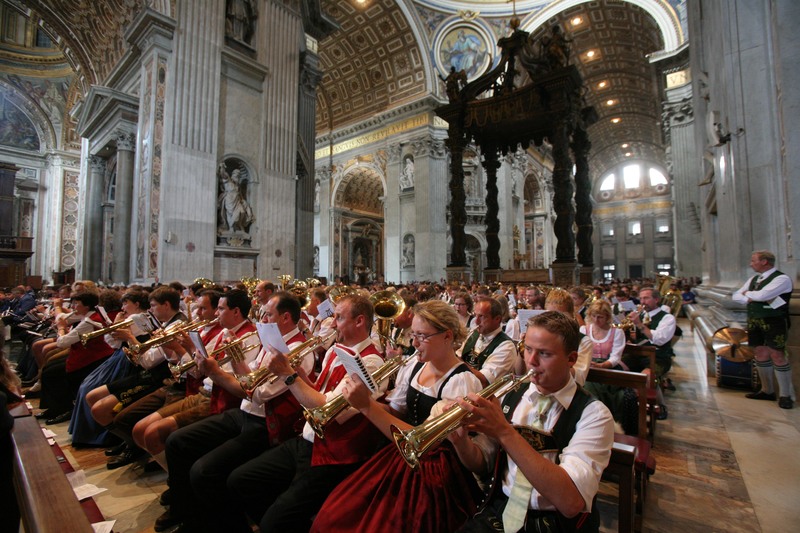 The bands will perform all together "Großer Gott wir loben Dich". The European Society of Historic Armed Guilds (EGS) organized a pilgrimage to Rome from 3rd to 7th November 2007. The Society is made of 28 federations from 12 European countries, for a total of around 3,000 groups and approximately six million marksmen and women. The EGS intends to preserve and strengthen the spirit of European fellowship and brotherhood, making it result in a lasting friendship which unites all European nations. Nearly 800 people took part in the pilgrimage to Rome, which started with the Holy Mass in St Peter’s Basilica celebrated by Dr. Heiner Koch, Ancillary Bishop of Cologne. In the afternoon the Historischer Schützen, together with marching bands and costume groups, participated in the parade dedicated to His Holiness Benedict XVI. All the groups, holding torch lights, marched along Via della Conciliazione and entered St. Peter’s Square where they lined up and performed the “Zapfenstreich”. On the Sunday morning the groups met again at Piazza del Sant’Uffizio and marched into St. Peter’s Square to participate in the Angelus Prayer. On the piazza, they lined up and played some songs for His Holiness Benedict XVI. The following day the Historischer Schützen had the opportunity to attend a round table at the Pontifical University “Legionaries of Christ” in Rome, followed by the celebration of the Holy Mass at the University church. The last day in Rome was dedicated to a guided tour of Romantic Rome (Piazza di Spagna, Via del Corso, Fontana di Trevi, Pantheon, Piazza Navona), the attendance of the Holy Mass in the Basilica of St. Mary Major and the investiture of the St. Sebastian’s European Order.